Sterling silver roundlet with incised floral pattern sheath. Guilded shaft and worm. Bladed worm. Stamped with "3" on end of handle. The Engleman collection is in honor of our father, Victor S. Engleman, who was passionate about wine during his 72 years with us. He was an avid wine collector, corkscrew collector, wine book collector, along with all other wine paraphernalia (including comic strips!). 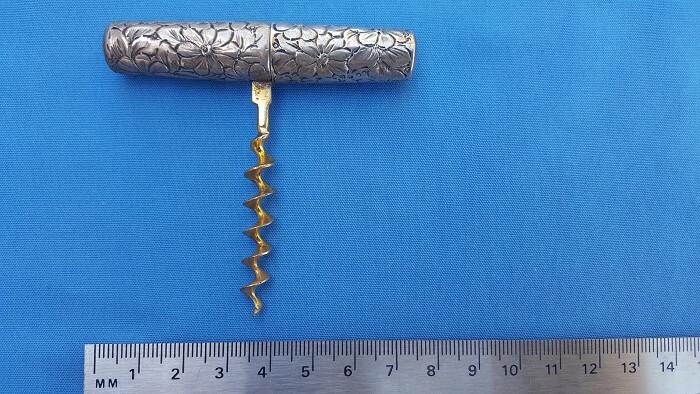 We are pleased and honored to offer the best of his corkscrew collection (50 years in the making) to you and hope you enjoy them as much as he did. Very good condition- no dents or cracks. Good full worm with sharp point. Add $7.50 for packing and shipping via U.S. Priority Mail. Bidders outside USA please inquire about shipping costs and declarations. This will typically be $25 for international priority mail. Optional merchandise insurance to U.S. locations (buyer assumes responsibility for uninsured parcels): Add $5.00 for coverage to $300; $9.05 for coverage to $600; and $1.25 per $100 or fraction thereof over $600 to $5,000. If you buy more than one item, we will do our best to combine into a single shipment to minimize shipping costs. We are happy to work with you on any special requests. For buyers outside of the U.S.
PayPal only, unless alternative method is mutually agreeable. For buyers within the U.S.
PayPal, personal checks, bank checks, money orders or cash with pick-up.